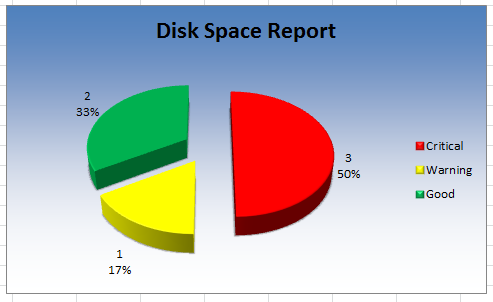 In the previous articles I have shown you how to use Excel with PowerShell to make a nice disk space report, complete with color coded rows for disks that are running low on space. I am now going to take this a step farther by showing how to add a chart (an exploded 3D pie chart in this case) and make some configuration changes to that chart. Another item is adding a filter for the headers to make it easier to narrow the scope of data that you want to view. Like the previous article, I will push through all of the existing code and offer more explanations with the new code for the chart and filtering. Lets kick off the excel reporting! Ok, same old stuff here. The only exception is now I added a new column called State that will be used to help create the chart later on in this article. Setting up the filtering actually is pretty simple. I just need to select all of the headers and use the AutoFilter() method. Now it doesn’t do us a lot of good without some sort of data in the report, but once we start pulling in some disk space information, it will be easy to only look at what we want. At the end of the article, I will show the benefits of adding this to your report. I am going to cheat a little on this portion by using the same 2 systems a number of times. This will give you a better idea on how the chart will look as well as the filtering. So just imagine that all of the systems are different. All of the data has been collected and added to the report. Basically, we are now at the same point as the previous article. Now we can take a look at the filter that was set up. In this case, I want to see all Critical drives, so I keep only Critical selected from the data set. Now I have only the Critical drives available to look at and decide how I want to deal with this. Great for whoever receives this report as they can filter for any sort of information they need without much work. The final piece that needs to be added is a chart. The chart I am looking at using is a pie chart that shows the number of critical,warning and good states for each drive. Before I can start working with this chart, I need to set up a temporary data source to count each number of states in the State column. First thing is to set up a header for each State before actually adding the data. I don’t bother with any fancy font on this as it is only going to be visible during its initial creation. 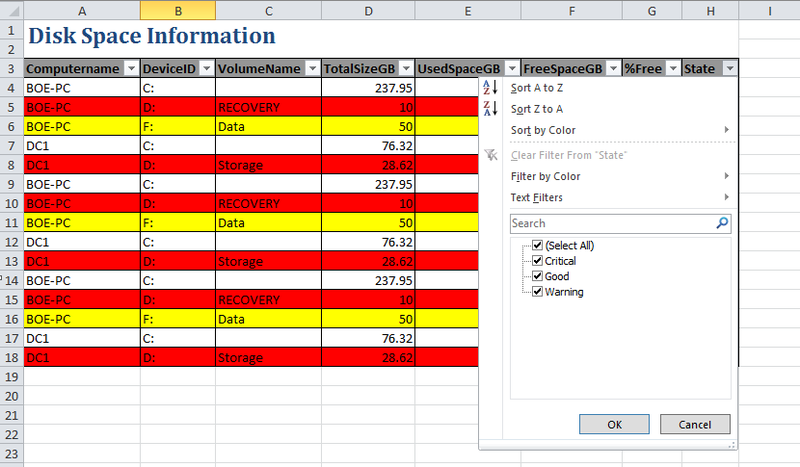 Next up is to setup a formula on each follow row for each cell. Notice that I use the $lastRow variable to handle the number of rows to look at in the formula. This will ensure that the data will be accurate. If you are wondering how I know how to do this as well as working with the charts, I relied heavily on using Excel macros to show me the code used and then translating that code into PowerShell. Trust me, this is not a simple walk in the park that I was able to come up with in a couple of minutes. 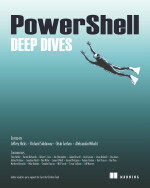 This required reading through the macros as well as some trial and error and reviewing the Excel Interop documentation out on the MSDN page. Others such as enums were found by running a code snippet that you will see later to determine the correct values that are needed for specific properties. Now it is time to add a chart to the report. Determining the chart type required a little bit of work to translate the chart type to an integer. In this case, I am looking for an exploded 3D pie chart to display. Looking at the values, I can see that this is 70. I adjust the angle of the chart so it is easier to read by others and then give it a different background color other than plain white. I also want to give it a gradient look, so I have to figure out the values of the gradient direction. Its coming along, but not quite there yet. I need to move it out of the way of the data. This took some trial and error to move the chart. But I was able to find something that I was happy with as far as the Top and Left placement. I am going to configure the chart to remain at the same size regardless of what happens with the cells/rows/columns in the spreadsheet. By default, the chart will adjust to whatever happens in the spreadsheet. First I have to determine the correct value to use with this. Now I know that I need to set the Placement property value to 2. Now I will go ahead and add the report data into the chart. Next up is to adjust the look of the chart. Here I will add a title, display both the percentage and the value in the pie chart as well as adding a legend to the chart. $chart.ChartTitle.Text = "Disk Space Report"
In this instance, I want the labels on the outside of the pic chart instead of being on the inside. I just need to know what the correct value is. Looks like I need to use the value 2 to get the information on the outside. Its coming together nicely, but I am just not completely satisfied with the chart yet. I want the pie chart to have the same colors as the data colors (red, yellow and then green (even though it is not used in the data) so it matches up more. Much better. Now to do some cleanup with the data used to create the chart. I am simply going to hide the Warning, Critical and Good header and data in the spreadsheet using my existing range $chartRange and setting the EntireRow.Hidden property to $True. I also need to name my spreadsheet and that is it! 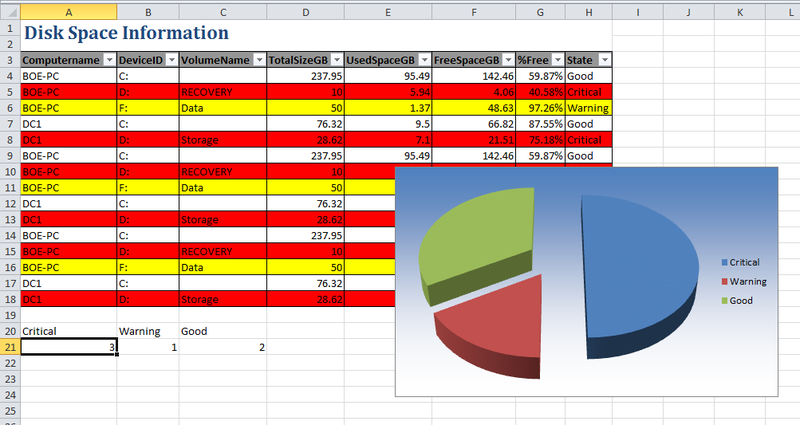 All that is left to do is to save this report off and close out of Excel with some cleanup of the COM object and now you have an excellent report that can be emailed out to others to view and take action on the drive space issues. When creating a chart with a report or even working with Excel for that matter, be sure to look at using a macro initially to get a better idea on what you need to use for the code. Many times the macro has most of the code in front of you and all you need to do is convert it to PowerShell and use it. 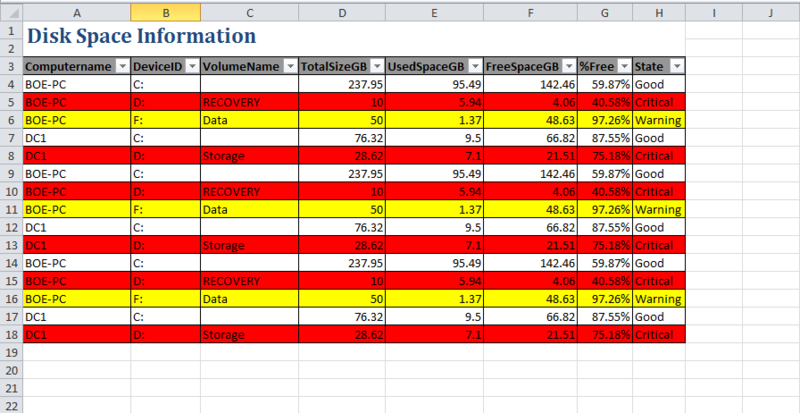 This entry was posted in Excel, Office, powershell and tagged chart, excel, filter, Powershell. Bookmark the permalink. if someone is wonder how to get it to pull from a server list in a .txt file here is how. Awesome post, will come in very handy. Thanks for your time and effort in writing this. Can you please let me know how to get the disk space for the list of servers in text file? Thanks Mohan! I actually have an updated version of this script that I will post next week that should be what you are looking for.